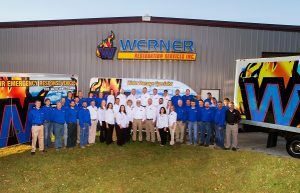 April 19, 2018 – Werner Restoration Services, a member company of DKI, North America’s largest disaster restoration contracting organization, proudly announced they were one of the five businesses chosen for the 2018 Quad Cities Better Business Bureau Torch Award. On April 26, the BBB will recognize Werner during a luncheon at Jumer’s Casino and Hotel in Rock Island, IL. The Torch Awards honor businesses which demonstrate exceptional ethical practices, generating high levels of trust among their employees, customers and communities. It is considered the most prestigious award the BBB can present to a business. “We believe in doing the right thing because we are people first. It’s completely irrelevant that we are in business. Doing the right thing is woven into our culture; a mindset that we feel will position Werner Restoration and 1-800 Board Up of the Quad Cities as a name to be trusted during a time of great need. It is my commitment as part owner and operations manager to do the right thing and do it all of the time,” said Brent Werner, operations manager of Werner. Werner Restoration Services is the premier water and fire damage restoration company in the Quad City and its surrounding areas. They are a family-owned company, providing help after a disaster affects families or other businesses. To learn more, visit www.wernerrestorationinc.com. The Better Business Bureau is dedicated to fostering honest and responsive relationships between businesses and consumers, and advancing a trustworthy marketplace for all. To learn more about the BBB Torch Awards, visit https://www.bbb.org/iowa/torch-awards-for-ethics.